Pheasant breasts are light in color with a mild flavor similar to chicken, though the meat is a bit richer and may have a slight gamy taste if the breast comes from a wild bird as opposed to a farm-raised pheasant. You can use pheasant breast in a variety of dishes, or simply serve it as a main course along with stuffing, vegetables, rice or nearly any side dish you choose. The meat cooks well in the oven, on the stove top, on the grill or even in a slow cooker. Place the pheasant breast in a mixture of water and kosher salt and brine in a covered bowl in the refrigerator for at least two hours prior to cooking. Replace some of the water with apple cider during the brining process to give the meat a slightly sweeter flavor. Brining helps the meat retain its juices during the cooking process. Remove the breast from the brining mixture and rinse it under cool running water to remove any salt clinging to the outside of the meat. Rub the breast with seasonings of your choice or baste the meat with butter or chicken broth to enhance the flavor. Avoid adding extra salt since the meat retains some salt during the brining process. Cover the bottom of a roasting pan with water or other cooking liquid and roast the breast, covered, at 250 to 325 degrees Fahrenheit. Alternatively, grill or cook the meat in a frying pan, searing each side until the juices run slightly pink. You can also place the breast in a slow cooker with water, broth or cream soups and vegetables, cooking on low throughout the day for tender pheasant breast by dinnertime. Check the internal temperature of the breast by sticking a meat thermometer into the meat at the thickest point. Pheasant should have an internal temperature of at least 165 degrees Fahrenheit. Let the pheasant rest for several minutes before serving to allow the juices to settle into the meat. Try serving pheasant breast in place of poultry in your favorite recipes. Cut up strips of the breast and add them to soups, salads or casseroles. Pour a sauce over the breast. Pheasant pairs well with sweet sauces, such as chutney. 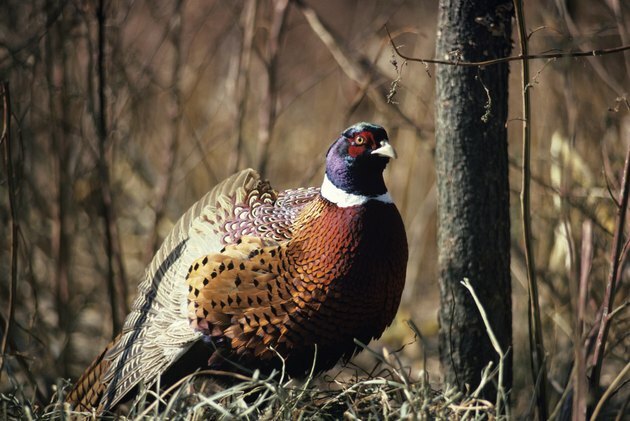 Store leftover pheasant in the refrigerator and eat it within one to two days.